Henry Allen "Harry" Ironside was born in Toronto, Canada. He was a Canadian-born American Bible teacher, preacher, theologian, pastor and author. His famaly moved to Los Angeles, California in 1886. He began his career as a writer, publishing several Bible commentary pamphlets. From 1916 to 1929, he preached almost 7,000 sermons to over 1.25 million listeners. In 1924, he began preaching under the direction of the Moody Bible Institute. After preaching a series of sermons at the Moody Church in Chicago, he was invited in 1929 to serve a trial year as pastor. 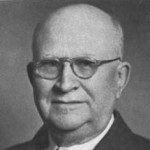 The following year he became the official pastor, and he served there until his wife's death in 1948. In 1930, Wheaton College presented Ironside with an honorary Doctorate of Letters degree, and in 1942 Bob Jones University awarded him an honorary Doctor of Divinity degree. In 1942, he also became president of the missionary organization, Africa Inland Mission. He wrote several books include: Minor prophets, Full assurance, Except Ye Repent, Romans and Galatians, Dr. Ironside's Bible, Revelation, and The continual burnt offering.